Researchers at North Carolina State University have created a new compound that can be integrated into silicon chips and is a dilute magnetic semiconductor — meaning that it could be used to make “spintronic” devices, which rely on magnetic force to operate, rather than electrical currents. “Spintronics” refers to technologies used in solid-state devices that take advantage of the inherent “spin” in electrons and their related magnetic momentum to store data. 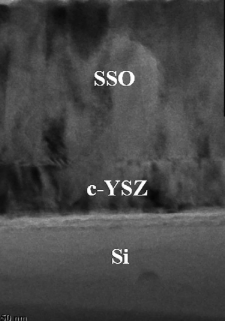 The researchers synthesized the new compound, strontium tin oxide (Sr3SnO), as an epitaxial thin film on a silicon chip (Epitaxial means the material is a single crystal). Sr3SnO is a dilute magnetic semiconductor, so it could be used to create transistors that operate at room temperature based on magnetic fields rather than electrical current. “There are other materials that are dilute magnetic semiconductors, but researchers have struggled to integrate those materials on a silicon substrate, which is essential for their use in multifunctional, smart devices,” says Dr. Jay Narayan, John C. Fan Distinguished Professor of Materials Science and Engineering at NC State and senior author of a paper describing the work.